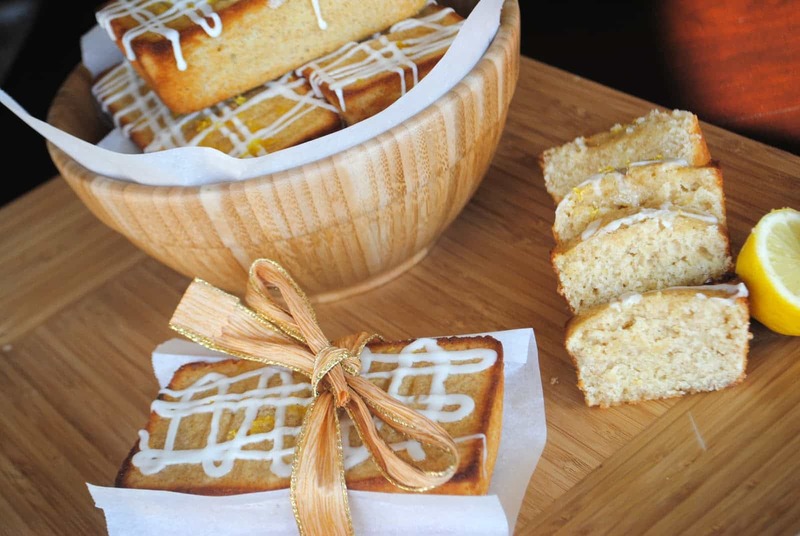 These mini loaves of lemon bread are absolutely fabulous. No really, they are. 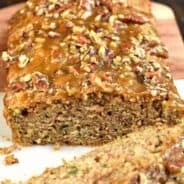 I have been filling my freezer lately with all sort of pastries and breads, so that when the holidays and guests arrive, I have a whole assortment of great treats to serve. This bread is no exception. I love that I can pull out one loaf when I have a friend stop over for coffee. It’s the perfect amount for two people. 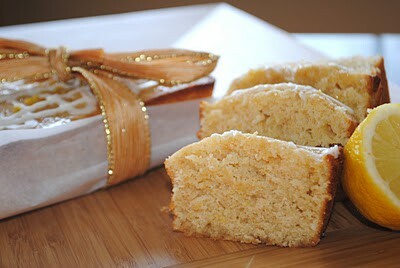 These little loaves would also make some great hostess gifts! Sadly, I only have a couple loaves remaining. They can also serve one person quite nicely throughout an afternoon. Just saying. In mixing bowl, combine sugar, lemon zest (from 2 lemons), and lemon juice. Add eggs, beating well after each addition. Beat in heavy cream. Gradually add in the flour, baking powder and salt. Fold in the melted butter. Pour batter into 6 mini loaf pans (3 3/4 by 2 3/4 by 1 3/4 inches). Bake in a 350 degree oven for 25 to 30 minutes. While baking, combine 1/3 cup lemon juice with 3/4 cup sugar in medium sized saucepan over high heat. Bring to a boil, then reduce heat and simmer for about 8 minutes, until thickened. Set aside. When loaves are cooled, drizzle glaze over each loaf, then sprinkle with remaining lemon zest. Cool completely. In small bowl whisk powdered sugar with milk (add more milk to desired consistency). Drizzle over loaves, allow to set. Enjoy! These are a perfect gift idea for those who enjoy something “not so sweet” love it! What a great recipe! I love the idea to use them as hostess gifts. Perfect! Beautiful pics, these look so good, and would make perfect holiday gifts for neighbors. Stopping by from tasty Tuesdays. Mmmm lemon is my fave!! These look so yummy and would make perfect gifts! WOW! 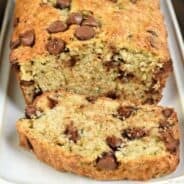 i love the recipe it looks delicious! i loved the way you presented it with the little ribon tied around it! YUM! I love lemon! Love the mini size! 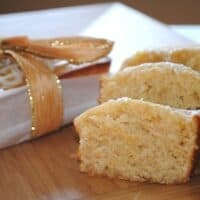 My Husband would love your mini lemon bread! It really looks delicious and I love your first photo!! mmm what a great gifty idea! Can’t wait to try. What do you eat them with it? 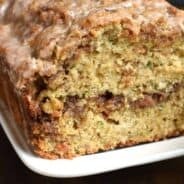 Can you use different size loaf pans? CC- I slice them and just eat as is (with my cup of coffee on the side). No need to butter or anything! Also, you can use a different size loaf pan, but you would have to adjust the proper cooking time (I would imagine if you used a regular sized loaf it would cook in about 50-65 minutes…). Best guess. Lemon is one of my all time favorite citrus fruits! Your cakes look fabulous all wrapped up for gifts! Making my mouth water! Thanks for linking up at A Little Nosh this week! I love lemon. Those sound so yummy and they look really cute too! Mmmmm… Aimee, they sound delicious and I love the way you packaged the loaves as well! I just made these last night and they are really tasty–the glaze, especially, is to die for. I have kind of a dumb question, though. I followed the recipe to a T (or so I thought), but the loaves are quite dense. Yours look light and fluffy. Any idea of where I might have gone wrong (I’m pretty sure it wasn’t my baking powder; it’s fairly new and I used the hot water test to make sure it still has oomph)? I’m so glad you enjoyed them! Because of the glaze they do become very dense. My picture might be deceiving in that way? They are not fluffy like a muffin, if that makes sense! I think it’s due to the lack of crumble from pouring the glaze on them! 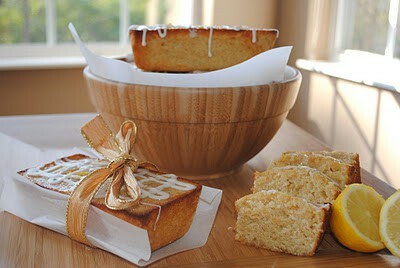 Please can you tell me can i put this recipe in to one large 2lb loaf tin or a 1lb tin If so how much time to bake. Can I double recipe? Make 12 instead of 6?